Splash Of Ginge put up a game front-running display to spring a 33-1 surprise in the valuable Betfair Hurdle at Newbury. Ryan Hatch made the most of his 7lb claim and his horse's light weight to land the spoils for the Nigel Twiston-Davies team. Splash Of Ginge kept on strongly from the final flight to take the prestigious handicap by a length and three-quarters from Dell' Arca (15-2), with Irish Saint (6-1 favourite) third and Cheltenian (8-1) fourth. Hatch told Channel 4 Racing: "I thought I had a quiet chance, but I didn't want to get over-excited and build my hopes up. He kept pulling it out. He was bought for the Grand National, but I think it's more County Hurdle at the minute." Delighted owner John Neild added: "I don't think this horse has had the credit he deserved. He wasn't an expensive purchase and in my opinion he would never have won a race had it not been for Nigel (Twiston-Davies) and everyone at that stable. I just can't believe it. "Ryan broke this horse in and was the first person to sit on him and I thought he gave him a tremendous ride." The six-year-old already holds entries in the Sky Bet Supreme Novices' Hurdle and the Neptune Investment Management Novices' Hurdle. 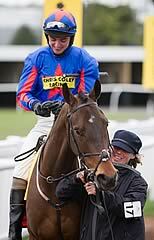 The next day, Nigel Twiston-Davies said: "That was very pleasing and a very good ride by Ryan (Hatch). The horse is fine this morning, 100%." "He'll definitely go to Cheltenham, but what race I don't know yet. It just depends what the handicapper does to him and what the novice hurdles look like etc."